With the data from our global survey of scholarly communication tool usage, we want to work towards identifying and characterizing full research workflows (from discovery to assessment). Previously, we explained the methodology we used to assess which tool combinations occur together in research workflows more often than would be expected by chance. How can the results (heatmap, values and calculations) be used to identify real-life research workflows? Which tools really love each other, and what does that mean for the way researchers (can) work? First of all, it is interesting to compare the sets of tools that are specifically used together (or not used together) with different tools/platforms. 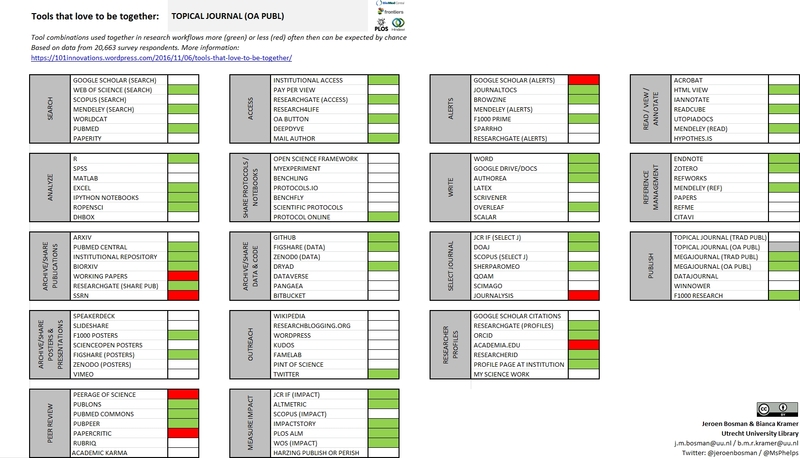 To make this easier, we have constructed an interactive online table (http://tinyurl.com/toolcombinations, with a colour-blind safe version available at http://tinyurl.com/toolcombinations-cb) that allows anyone to select a specific tool and see those combinations. For instance, comparing tools specifically used by people publishing in journal from open access publishers vs. traditional publishers (Figure 1,2) reveals interesting patterns. For example, while publishing in open access journals is correlated with the use of several repositories and preprint servers (institutional repositories, PubMedCentral and bioRxiv, specifically), publishing in traditional journals is not. The one exception here is sharing publications through ResearchGate, an activity that seems to be positively correlated with publishing regardless of venue…. Another interesting finding is that while both people who publish in open access and traditional journals specifically use the impact factor and Web of Science to measure impact (again, this may be correlated with the activity of publishing, regardless of venue), altmetrics tools/platforms are used specifically by people publishing in open access journals. There is even a negative correlation between the use of Altmetric and ImpactStory and publishing in traditional journals. Such results can also be interesting for tool/platform providers, as it provides them with information on other tools/platforms their users employ. In addition to the data on tools specifically used together, providers could also use absolute numbers on tool usage to identify tools that are popular, but not specifically used with their own tool/platform (yet). This could identify opportunities to improve interoperability and integration of their own tool with other tools/platforms. All data are of course fully open and available for any party to analyze and use. The examples above show that, although we only analyzed combinations of any two tools/platforms so far, these data already bring to light some interesting differences between research workflows. There are several possibilities to extend this analysis from separate tool combinations into groups of tools typifying full research workflows. Two of these possibilities are looking at clusters and cliques, respectively. Based on our co-occurrence data, we can look at which tools occur in similar workflows, i.e. have the most tools in common that they are or are not specifically used with. This can be done in R using a clustering analysis script provided by Bastian Greshake (see GitHub repo with code, source data and output). When run with our co-occurrence data, the script basically sorts the original heatmap with green and red cells by placing tools that have a similar pattern of correlation with other tools closer together (Figure 3). The tree structure on both sides of the diagram indicates the hierarchy of tools that are most similar in this respect. Figure 3. Cluster analysis of tool usage across workflows (click on image for larger version). Blue squares A and B indicate clusters highlighted in Figure 4. A color-blind safe version of this figure can be found here. Although the similarities (indicated by the length of the branches in the hierarchy tree, with shorter lengths signifying closer resemblance) are not that strong, still some clusters can be identified. For example, one cluster contains popular, mostly traditional tools (Figure 4A) and another cluster contains mostly innovative/experimental tools, that apparently occur in similar workflows together. (Figure 4B). Figure 4. Two examples of clusters of tools (both clusters are highlighted in blue in Figure 3). Another approach to defining workflows is to identify groups of tools that are all specifically used with *all* other tools in that group. In network theory, such groups are called ‘cliques’. Luckily, there is a good R-library (igraph) for identifying cliques from co-occurrence data. Using this library (see GitHub repo with code, source data and output) we found that the largest cliques in our set of tools consist of 17 tools . We identified 8 of these cliques, which are partially overlapping. In total, there are over 3000 ‘maximal cliques’ (cliques that cannot be enlarged) in our dataset of 119 preset tools, varying in size from 3 tot 17 tools. So there is lots to analyze! An example of one of the largest cliques is shown in Figure 5. This example shows a workflow with mostly modern and innovative tools, with an emphasis on open science (collaborative writing, sharing data, publishing open access, measuring broader impact with altmetrics tools), but surprisingly, these tools are apparently also all used together with the more traditional ResearcherID. A hypothetical explanation might be that this represents the workflow of a subset of people actively aware of and involved in scholarly communication, who started using ResearcherID when there was not much else, still have that, but now combine it with many other, more modern tools. It’s important to realize the difference between the two approaches described above. While the clustering algorithm considers similarity in patterns of co-occurrences between tools, the clique approach identifies closely linked groups of tools, that can, however, each also co-occur with other tools in workflows. In other words, tools/platform that are clustered together occur in similar workflows, but do not necessarily all specifically occur together (see the presence of white and red squares in Figure 4A,B). Conversely, tools that do all specifically occur together, and thus form a clique, can appear in different clusters, as each can have a different pattern of co-occurrences with other tools (compare Figures 3/5). In addition, it is worth noting that these approaches to identifying workflows are based on statistical analysis of aggregated data – thus, clusters or cliques do not necessarily have an exact match with individual workflows of survey respondents.Thus we are not describing actual observed patterns, but are inferring patterns based on observed strong correlations of pairs of tools/platforms. Our current analyses of tool combinations and workflows are based on survey answers from all participants, for the 119 preset tools in our survey. We would like to extend these analyses to include tools most often mentioned by participants as ‘others’. We also want to focus on differences and similarities of workflows of specific subgroups (e.g. different disciplines, research roles and/our countries). The demographic variables in our public dataset (on Zenodo or Kaggle) allow for such breakdowns, but it would require coding an R script to generate the co-occurrence probabilities for different subgroups. And finally, we can add variables to the tools, for instance , classifying which tools support open research practices and which don’t. This then allows us to investigate to which extent full Open Science workflows are not only theoretically possible, but already put into practice by researchers. On December 7, 2016, at the STM Innovations Seminar we gave a presentation (available from Figshare) on academic social networks. For this, we looked at the functionalities and usage of three of the major networks (ResearchGate, Mendeley and Academia.edu) and also offered some thoughts on the values and choices at play both in offering and using such platforms. Academic social networks support activities across the research cycle, from getting job suggestions, sharing and reading full-text papers to following use of your research output within the system. We looked at detailed functionalities offered by ResearchGate, Mendeley and Academia.edu (Appendix 1) and mapped these against seven phases of the research workflow (Figure 1). In total, we identified 170 functionalities, of which 17 were shared by all three platforms. The largest overlap between ResearchGate and Academia lies in functionalities for discovery and publication (a.o. sharing of papers), while for outreach and assessment, these two platforms have many functionalities that do not overlap. Some examples of unique functionalities include publication sessions (time-limited feedback sessions on one of your full text papers) and making metrics public or private in Academia, and Q&A’s, ‘enhanced’ full-text views and downloads and the possibility to add additional resources to publications in ResearchGate. Mendeley is the only platform offering reference management and specific functionality for data storage, according to FAIR principles. A detailed list of all functionalities identified can be found in Appendix 1. Within the seven phases of the research cycle depicted above, we identified 31 core research activities. If the functionalities of ResearchGate, Mendeley and Academia are mapped against these 31 activities (Figure 2), it becomes apparent that Mendeley offers the most complete support of discovery, which ResearchGate supports archiving/sharing of the widest spectrum of research output. All three platforms support outreach and assessment activities, including impact metrics. In addition, some research activities are underserved by the three major platforms. Most notably among these are activities in the analysis phase, where functionality to share notebooks and protocols might be a useful addition, as would text mining of full-text publications on the platform. And while Mendeley offers extensive reference management options, support for collaborative writing is currently not available on any of the three platforms. Providers of academic social networks clearly aim to offer researchers a broad range of functionalities to support their research workflow. But which of these functionalities are used by which researchers? For that, we looked at the data of 15K researchers from our recent survey on scholarly communication tool usage. Firstly, looking at the question on which researcher profiles people use (Figure 3), it is apparent that of the preselected options, ResearchGate is the most popular. This is despite the factor that overall Academia.edu report a much higher number of accounts (46M compared to 11M for ResearchGate). One possible explanation for this discrepancy could be a high number of lapsed or passive accounts on Academia.edu – possibly set up by students. Looking a bit more closely at the use of ResearchGate and Academia in different disciplines (Figure 4), ResearchGate proves to be dominant in the ‘hard’ sciences, while Academia is more popular in Arts & Humanities and to a lesser extent in Social Sciences and Economics. Whether this is due to the specific functionalities the platforms offer, the effect of what one’s peers are using or even to the name of the platforms (with researchers from disciplines identifying more with the term ‘Research’ than ‘Academia’ or vice versa) is up for debate. If they come, what do they do? Our survey results also give some indication as to what researchers are using academic social networks for. We had ResearchGate and Mendeley as preset answer options in a number of questions about different research activities, allowing a quantitative comparison of the use of these platforms for these specific activities (Figure 5). These results show that of these activities, ResearchGate is most often used as researcher profile, followed by its use for getting access to publications and sharing publications, respectively. Mendeley was included as preset answer option for different activities; of these, it is most often used for research management, following by reading/viewing/annotating and searching for literature/data. The results also show that for each activity it was presented as a preset option for, ResearchGate is used by most often by postdocs, while Mendeley is predominantly used by PhD students. Please note that these results do not allow a direct comparison between ResearchGate and Mendeley, except for the fourth activity in both charts: getting alerts/recommendations. In addition to choosing tools/platforms presented as preset options, survey respondents could also indicate any other tools they use for a specific activity. This allows us to check for which other activities people use any of the academic social networks, and plot these against the activities these platforms offer functionalities for. The results are shown in Figure 6 and indicate that, in addition to activities supported by the respective platforms, people also carry out activities on social networks for which there are no dedicated functionalities. Some examples are using Academia and ResearchGate for reference management, and sharing all kinds of research outputs, including formats not specifically supported by the respective networks. Some people even indicate using Mendeley for analysis – we would love to find out what type of research they are carrying out! For much more and alternative data on use of these platforms’ functionalities please read the analyses by Ortega (2016), based on scraping millions of pages in these systems. Academic social networks are built for and used by many researchers for many different activities. But what kind of scholarly communication do they support? At Force11, the Scholarly Communications Working Group (of which we both are steering committee members) has been working on formulating principles for scholarly communication that encourage open, equitable, sustainable, and research- and culture-led (as opposed to technology- and business-model led) scholarschip. This requires, among other things, that research objects and all information about them can be freely shared among different platforms, and not be locked into any one platform. While Mendeley has an API they claim is fully open, both ResearchGate and Academia are essentially closed systems. For example, all metrics remain inside the system (though Academia offers an export to csv that we could not get working) and by uploading full text to ResearchGate you grant them the right to change your PDFs (e.g. by adding links to cited articles that are also in ResearchGate). There are platforms that operate from a different perspective, allowing a more open flow of research objects. Some examples are the Open Science Framework, F1000 (with F1000 Workspace), ScienceOpen, Humanities Commons and GitHub (with some geared more towards specific disciplines). Not all platforms support all the same activities as ResearchGate and Academia (Figure 7), and there are marked differences in the level of support for activities: sharing a bit of code through ResearchGate is almost incomparable to the full range of options for this at GitHub. All these platforms pose alternatives for researchers wanting to conduct and share their research in a truly open manner. Academic Social Networks: Collaborative Environments or Diogenes Clubs? José Luis Ortega, The Scholarly Kitchen, December 8, 2016. Do academic social networks share academics’ interests? David Matthews , Times Higher Education. April 7, 2016. The role of ego in academic profile services: Comparing Google scholar, ResearchGate, Mendeley, and ResearcherID. Alberto Martín-Martín, Enrique Orduna-Malea and Emilio Delgado López-Cózar, LSE Impact Blog, March 4, 2016. List of functionalities within ResearchGate, Mendeley and Academia (per 20161204). A live, updated version of this table can be found here: http://tinyurl.com/ACMERGfunctions. Our survey data analyses so far have focused on tool usage for specific research activities (e.g. GitHub and others: data sharing, Who is using altmetrics tools, The number games). As a next step, we want to explore which tool combinations occur together in research workflows more often than would be expected by chance. This will also facilitate identification of full research workflows, and subsequent empirical testing of our hypothetical workflows against reality. Checking which tools occur together more often than expected by chance is not as simple as looking which tools are most often mentioned together. For example, even if two tools are not used by many people, they might still occur together in people’s workflows more often than expected based on their relatively low overall usage. Conversely, take two tools that each are used by many people: stochastically, a sizable proportion of those people will be shown to use both of them, but this might still be due to chance alone. Thus, to determine whether the number of people that use two tools together is significantly higher than can be expected by chance, we have to look at the expected co-use of these tools given the number of people that use either of them. This can be compared to the classic example in statistics of taking colored balls out of an urn without replacement: if an urn contains 100 balls (= the population) of which 60 are red (= people in that population who use tool A), and from these 100 balls a sample of 10 balls is taken (= people in the population who use tool B), how many of these 10 balls would be red (=people who use both tool A and B)? This will vary with each try, of course, but when you repeat the experiment many times, the most frequently occurring number of red balls in the sample will be 6. The stochastic distribution in this situation is the hypergeometric distribution. For any possible number x of red balls in the sample (i.e. 1-10), the probability of result x occurring at any given try can be calculated with the hypergeometric probability function. The cumulative hypergeometric probability function gives the probability that the number of red balls in the sample is x or higher. This probability is the p-value of the hypergeometric test (identical to the one-tailed Fisher test), and can be used to assess whether an observed result (e.g. 9 red balls in the sample) is significantly higher than expected by chance. In a single experiment as described above, a p-value of less than 0.05 is commonly considered significant. In our example, the probability of getting at least 9 red balls in the sample is 0.039 (Figure 2). Going back to our survey data, this translates to the probability that in a population of 100 people, of which 60 people use tool A and 10 people use tool B, 9 or more people use both tools. Figure 2 Example of hypergeometric probability calculated using GeneProf. In applying the hypergeometric test to our survey data, some additional considerations come into play. First, for each combination of two tools, what should be taken as total population size (i.e. the 100 balls/100 people in the example above)? It might seem intuitive that that population is the total number of respondents (20,663 for the survey as a whole). However, it is actually better to use only the number of respondents who answered the survey questions where tools A and B occurred as answers. People who didn’t answer both question cannot possibly have indicated using both tools A and B. 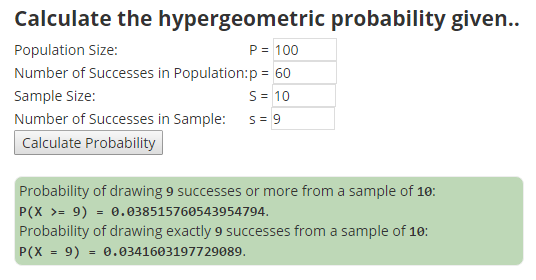 In addition, the probability that at least x people are found to use tools A and B together is lower in a large total population than in a small population. This means that the larger the population, the smaller the number of respondents using both tools needs to be for that number to be considered significant. Thus, excluding people that did not answer both questions (and thereby looking at a smaller population) sets the bar higher for two tools to be considered preferentially used together. The other consideration in applying the hypergeometric test to our survey data is what p-value to use as a cut-off point for significance. As said above, in a single experiment, a result with a p-value lower than 0.05 is commonly considered significant. However, with multiple comparisons (in this case: when a large number of tool combinations is tested in the same dataset), keeping the same p-value will result in an increased number of false-positive results (in this case: tools incorrectly identified as preferentially used together). The reason is that a p-value of 0.05 indicates there is a 5% chance the observed result is due to chance. With many observations, there will be inevitably be more results that may seem positive, but are in reality due to chance. One possible solution to this problem is to divide the p-value threshold by the number of tests carried out simultaneously. This is called the Bonferroni correction. In our case, where we looked at 119 tools (7 preset answer options for 17 survey questions) and thus at 7,021 unique tool combinations, this results in a p-value threshold of 0.0000071. Finally, when we not only want to look at tools used more often together than expected by chance, but also at tools used less often together than expected, we are performing a 2-tailed, rather than a 1-tailed test. This means we need to halve the p-value used to determine significance, resulting in a p-value threshold of 0.0000036.
d) the number of people that answered both survey questions X and Y (i.e. indicated using at least one tool (including ‘others’) for activity X and one for activity Y). These numbers were extracted from the cleaned survey data either by filtering in Excel (a,b (12 MB), d (7 MB)) or through an R-script (c, written by Roel Hogervorst during the Mozilla Science Sprint. Bonferroni correction was applied to the resulting p-values as described above and conditional formatting was used to color the cells. All cells with a p-value less than 0.0000036 were colored green or red, for tools used more or less often together than expected by chance, respectively. 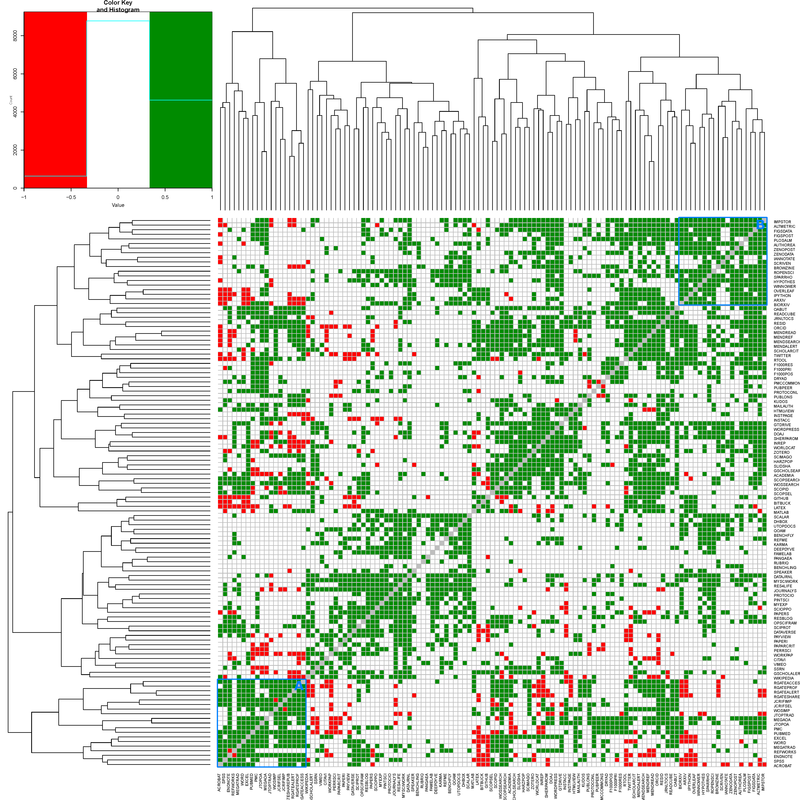 The results were combined into a heatmap with green-, red- and non-colored cells (Fig 4), which can also be found as first tab in the Excel-files (values & calculations). 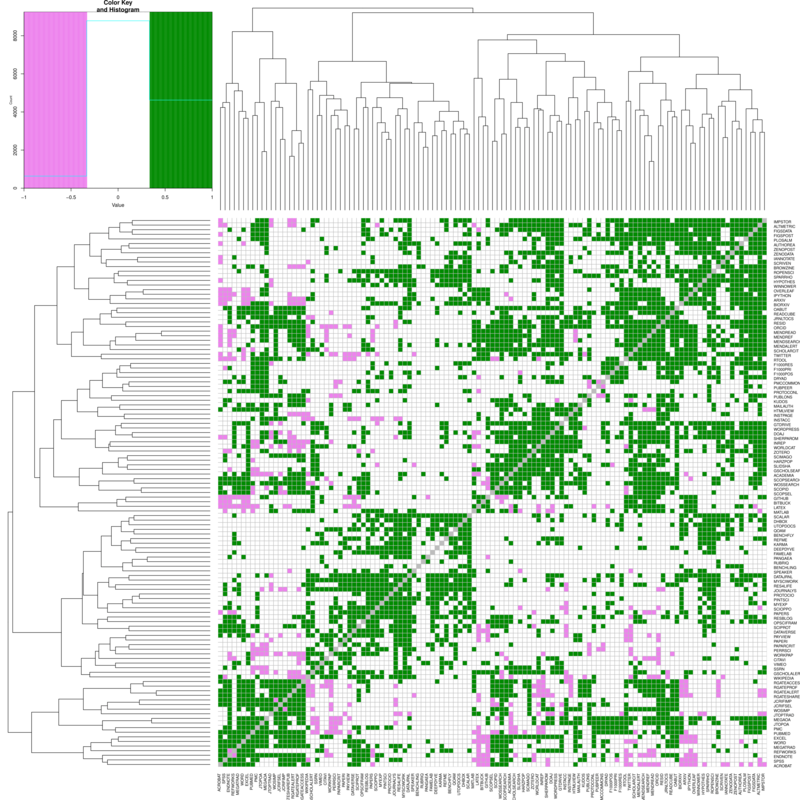 Figure 4 Heatmap of tool combinations used together more (green) or less (red) often than expected by chance (click on the image for a larger, zoomable version). While this post focused on methodological aspects of identifying relevant tool combinations, in future posts we will show how the results can be used to identify real-life research workflows. Which tools really love each other, and what does that mean for the way researchers (can) work? A recent Nature News article ‘Democratic databases: Science on GitHub‘ discussed GitHub and other programs used for sharing code and data. As a measure for GitHub’s popularity, NatureNews looked at citations of GitHub repositories in research papers from various disciplines (source: Scopus). The article also mentioned BitBucket, Figshare and Zenodo as alternative tools for data and code sharing, but did not analyze their ‘market share’ in the same way. Our survey on scholarly communication tools asked a question about tools used for archiving and sharing data & code, and included GitHub, FigShare, Zenodo and Bitbucket among the preselected answer options (Figure 1). Thus, our results can provide another measurement of use of these online platforms for sharing data and code. Perhaps the most striking result is that of the 14,896 researchers among our 20,663 respondents (counting PhD students, postdocs and faculty), only 4,358 (29,3%) reported using any tools for archiving/sharing data. Saliently, of the 13,872 researchers who answered the question ‘Do you support the goals of Open Science’ (defined in the survey as ‘openly creating, sharing and assessing research, wherever viable’), 80,0% said ‘yes’. Clearly, for open science, support in theory and adoption in practice are still quite far apart, at least as far as sharing data is concerned. Among those researchers that do archive and share data, GitHub is indeed the most often used, but just as many people indicate using ‘others’ (i.e. tools not mentioned as one of the preselected options). Figshare comes in third, followed by Bitbucket, Dryad, Dataverse, Zenodo and Pangaea (Figure 3). Among ‘others’, the most often mentioned tool was Dropbox (mentioned by 496 researchers), with other tools trailing far behind. Unfortunately, the survey setup invalidates direct comparison of the number of responses for preset tools and tools mentioned as ‘others’ (see: Data are out. Start analyzing. But beware). Thus, we cannot say whether Dropbox is used more or less than GitHub, for example, only that it is the most often mentioned ‘other’ tool. As mentioned above, 29,3% of researchers in our survey reported to engage in the activity of archiving and sharing code/data. Are there disciplinary differences in this percentage? We explored this earlier in our post ‘The number games‘. We found that researchers in engineering & technology are the most inclined to archive/share data or code, followed by those in physical and life sciences. Medicine, social sciences and humanities are lagging behind at more or less comparable levels (figure 4). But is is also clear that in all disciplines archiving/sharing data or code is an activity that still only a minority of researchers engage in. Do researchers from different disciplines use different tools for archiving and sharing code & data? Our data suggest that they do (Table 1, data here). Percentages given are the share of researchers (from a given discipline) that indicate using a certain tool. For this analysis, we looked at the population of researchers (n=4,358) that indicated using at least one tool for archiving/sharing data (see also figure 4). As multiple answers were allowed for disciplines as well as tools used, percentages do not add up to 100%. While it may be no surprise that researchers from Physical Sciences and Engineering & Technology are the most dominant GitHub users (and also the main users of BitBucket), GitHub use is strong across most disciplines. Figshare and Dryad are predominantly used in Life Sciences, which may partly be explained by the coupling of these repositories to journals in this domain (i.e. PLOS to Figshare and Gigascience, along with many others, to Dryad). As a more surprising finding, Dataverse seems to be adopted by some disciplines more than others. This might be due to the fact that there is often institutional support from librarians and administrative staff for Dataverse (which was developed by Harvard and is in use at many universities). This might increase use by people who have somewhat less affinity with ‘do-it-yourself’ solutions like GitHub or Figshare. An additional reason, especially for Medicine, could be the possibility of private archiving of data in Dataverse, with control over whom to give access. This is often an important consideration when dealing with potentially sensitive and confidential patient data. Another surprising finding is the overall low use of Zenodo – a CERN-hosted repository that is the recommended archiving and sharing solution for data from EU-projects and -institutions. The fact that Zenodo is a data-sharing platform that is available to anyone (thus not just for EU project data) might not be widely known yet. A final interesting observation, which might go against the common idea, is that among researchers in Arts&Humanities who archive and share code, use of these specific tools is not lower than in Social Sciences and Medicine. In some cases, it is even higher. A more detailed breakdown, e.g. across research role (PhD student, postdoc or faculty), year of first publication or country is possible using the publicly available survey data. In our global survey on innovations in scholarly communication, we asked researchers (and people supporting researchers, such as librarians and publishers) what tools they use (or, in the case of people supporting researchers, what tools they advise) for a large number of activities across the research cycle. The results of over 20,000 respondents, publicly available for anyone analyze, can give detailed information on tool usage for specific activities, and on what tools are preferentially used together in the research workflow. It’s also possible to look at results for different disciplines, research roles, career stages and countries specifically. But we don’t even have to dive into the data at the level of individual tools to see interesting patterns. Focusing on the number of people that answered specific questions, and on the number of tools people indicate they use (regardless of which tools that are) already reveals a lot about research practices in different subsets of our (largely self-selected) sample population. In total, we received 20,663 responses. Not all respondents answered all questions, though. The number of responses per activity could be seen to reflect whether that activity plays a role in the research workflow of respondents, or at least, to what extent they use (or advise) concrete tools to carry out that activity (although we also included all answers like ‘manually’, ‘in person’ etc). 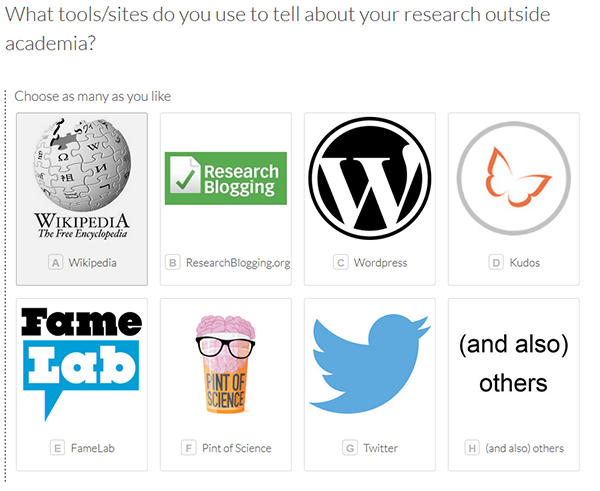 For each question on tool usage, we offered seven preselected choices that could be clicked (multiple answers allowed), and an ‘and also others’ answer option that, when clicked, invited people to manually enter any other tools they might use for that specific research activity (see Figure 1). We did not include a ‘none’ option, but at the beginning of the survey stated that people were free to skip any question they felt did not apply to them or did not want to answer. Nonetheless, many people still answered ‘none’ (or any variation thereof) as their ‘other’ options. Since methodologically, we cannot make a distinction between people who skipped a question or who answered ‘none’, we removed all ‘none’ answers from the survey result. We also adjusted the number of respondents that clicked the ‘and also other’ option to only reflect those that indicated they used at least one tool for the specific research activity (excluding all ‘nones’ and empty answers). Figure 2 shows the percentage of respondents that answered each specific research activity question, both researchers (PhD students, postdocs and faculty) and librarians. The activities are listed in the order they were asked about, illustrating that the variation in response rate across questions is not not simply due to ‘survey fatigue’ (i.e. people dropping out halfway through the survey). The differences in response levels to the various questions are quite marked, ranging from barely 15% to almost 100%. It is likely that two effects are at play here. First, some activities are relevant for all respondents, e.g. writing and searching information, while others like sharing (lab) notebooks are specific to certain fields, explaining lower response levels. Second, there are some activities that are not yet carried out by many or for which respondents choose not to use any tool. This may be the case with sharing posters and presentations and with peer review outside that organized by journals. Then there are also notable differences between researchers and librarians. Researchers expectedly more often indicate tool usage to publish and librarians are a bit more active in using or advocating tools for reference management. Perhaps more interestingly, it is clear that librarians are “pushing” tools that support sharing and openness of research. The differences in response levels to the various questions are quite marked, ranging from barely 15% to almost 100%. Some activities seem relevant for all respondents, e.g. writing and searching information. Others, like sharing (lab) notebooks, sharing posters and presentations and peer review outside that organized by journals, may be carried out by . fewer people, or may be done without using specific tools. Then there are also notable differences between researchers and librarians. As expected, researchers more often indicate tool usage to publish and librarians are a bit more active in using or advocating tools for reference management and selection of journals to publish in. Perhaps more interestingly, it is clear that librarians are “pushing” tools that support sharing and openness of research. When we look at not just the overall number of respondents per activity, but break that number down for the various disciplines covered (Figure 3), more patterns emerge. Some of these are expected, some more surprising. As expected, almost all respondents, irrespective of discipline, indicate using tools for searching, getting access, writing and reading. Researchers in Arts & Humanities and Law report lower usage of analysis tools than those in other disciplines, and sharing data & code is predominantly done in Engineering & Technology (including computer sciences). 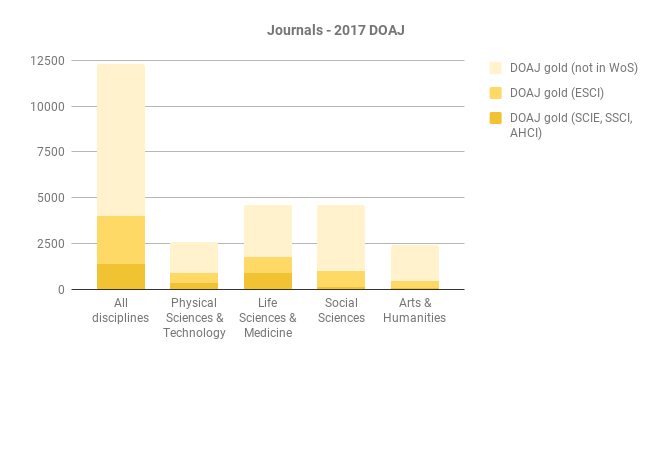 The fact that Arts & Humanities and Law also score lower on tool usage for journal selection, publishing and measuring impact than other disciplines might be due to a combination of publication culture and the (related) fact that available tools for these activities are predominantly aimed at journal articles, not books. Among the more surprising results are perhaps the lower scores for reference management for Arts & Humanities and Law (again, this could be partly due to publication culture, but most reference management systems enable citation of books as well as journals). Scores for sharing notebooks and protocols were low overall, where we would have expected this activity to occur somewhat more often in the sciences (perhaps especially life sciences). Researchers in Social Sciences & Economics and in Arts & Humanities relatively often use tools to archive & share posters and presentations and to do outreach (phrased in the survey as: “tell about your research outside academia”), and interestingly enough, so do researchers in Engineering & Technology (including computer science). Finally, peer review outside that done by journals is most often done in Medicine, which is perhaps not that surprising given that many developments in open peer review are pioneered in biomedical journals such as The BMJ and BioMedCentral journals. You’re using HOW many tools? How many apps do you have on your smartphone*? On your tablet? Do you expect the number of online tools you use in your daily life as a researcher to be more or less than that? Looking at the total number of tools that respondents to our survey indicate they use in their research workflow (including any ‘other’ tools mentioned, but excluding all ‘nones’, as described above), it turns out the average number of tools reported per person is 22 (Figure 4). The frequency distribution curve is somewhat skewed as there is a longer tail of people using higher numbers of tools (mean = 22.3; median = 21.0). We also wondered whether the number of tools a researcher uses varies with career stage (e.g. do early career researchers use more tools than senior professors?). Figure 5 shows the mean values of the number of tools mentioned by researchers, broken down by career stage. We used year of first publication as a proxy for career stage, as it is a more or less objective measure across research cultures and countries, and less likely to invoke ‘refuse to answer’ then asking for age might have been. There is an increase in the number of tools used going from early to mid career stages; peaking for researchers who published their first paper 10-15 years ago. Conversely, more senior researchers seem to use less tools, with the number of tools decreasing most for researchers who first published over 25 years ago. The differences are fairly small, however, and it remains to be seen whether they can be proven to be significant. There also might be differences across disciplines in these observed trends, depending on publication culture within disciplines. We have not further explored this yet. It will be interesting to correlate career stage not only with the number of tools used, but also with type of tools: do more senior researchers use more traditional tools that they have been accustomed to using throughout their career, while younger researchers gravitate more to innovative or experimental tools that have only recently become available? By combining results from our survey with information collected in our database of tools, these are the type of questions that can be explored.